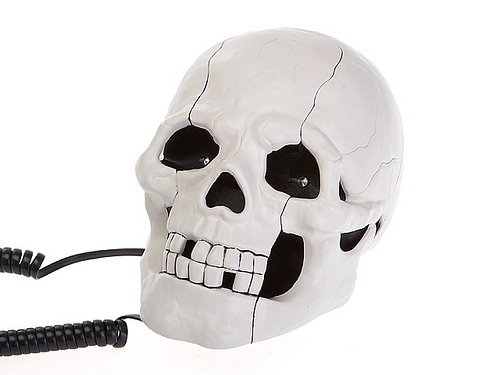 Skull Phone. Your original design with a skull. We do not know if anyone will dare to take the call. Phone with original design, shaped like a skull. And yes, it is forbidden to bite, especially, not to test their circuits and chips. If you pick up the phone keypad have skull and speaker / microphone. The skull's eyes light up when a call rings. Cash and two colors: white or black skull skull. Skull Phone Measures: 19 x 13 x 12 cm.